Do You Have a Ritual For Writing Blog Articles? Have you had trouble getting words down on the page? Have you ever considered adding a ritual to your writing blog articles? Hello everyone and happy Tuesday! This summer seems to already be flying by. Can you believe that it is almost August? If you’ve read this blog before, you will know that I am an avid researcher. I love to read up on new blogging information. I am always looking for new ideas to help me produce blogs for my ghost writing services. How Do I Produce Original Content on a Regular Basis? One thing that I come back to time and time again – and many of my lovely readers do as well – is how to produce original content on a regular basis. Some of my readers get this and are able to produce original content easily and I am jealous of you. I have to work at creating original content. I have to research and I have to have my ritual. If I deviate from this ritual, I’m not as productive and I struggle to think of any ideas. When I follow this little ritual, I can get multiple blogs done and I get them done quickly. I didn’t think about sharing my ritual with you until I was reading an article from Copyblogger called 8 Strange Rituals of Productive Writers. When I first saw that title I thought, I want to be a more productive writer and I guess I do have a ritual. I highly recommend reading the article. Kelton writes about how Winston Churchill even had a ritual of writing horizontally. If Winston Churchill had a ritual, I feel pretty good about having one as well. 6 a.m.: I’m up and making coffee, grabbing my computer and heading to my couch. I check up on email and make sure I’m caught up on Facebook and blog comments. If I’m going to really be productive, I have to get up before the rest of my family. Some days, 6 a.m. isn’t good enough. 6:15 a.m.: I pour a big cup of coffee. This is probably the most important part – good coffee. It’s a big cup of Starbucks Verona and I’ll add a packet of Truvia (zero calorie sweetener) and cream. 6:25 a.m.: I’m ready to write. Coffee has set in, I’m caught up on everything and my family is sleeping. I keep writing through the morning, until I’m done or my time is up and my family wakes up. I’ve tried writing at other times of the day and with different stages of life the times I write have changed. For now, this is the perfect time to write before anything else is on my mind. So what do you think? 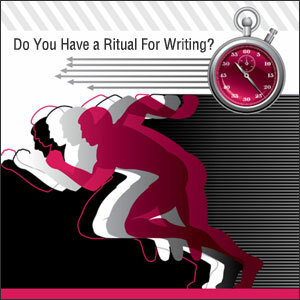 Do you have a set ritual that helps you to write more productively? Would you mind sharing it in the comments? I would love to hear your ideas. If you don’t have a ritual, what do you think about trying one out? Thanks everyone and have a wonderful week! I cannot write an article in one sitting…usually. I think about it, mull it over, do a bit of research, and let it simmer. Then I come back to it sporadically throughout the day. Then it all begins to gel and I get into focus mode. Focus mode is when I am in the zone. However, sometimes I am under a deadline, and in those cases, I just do it! That is a great ritual right there. Giving your idea the time to grow and develop. Thanks for sharing. My ritual is a bit more drawn out, like Lisa’s. I usually come up with an idea while reading, on a webinar or in my “think spots” which are in the shower, in the subway or in the car (is that weird?!). I’ll jot down a few notes, research the topic a bit, draw on my own experiences and get to writing. With editing, writing and finding pictures it usually is a one to three-day process. I suppose that’s my ritual, though not as nice and neat as yours! Thats great. It’s all about what works for you! None of your “think spots” are weird. Thanks so much for sharing. Hi Christine, An interesting article that rings true for many people I would say. It is only on reading an article like this that you really think about it. I have developed a routine by default so that my productive time is probably when I work while my wife goes bush walking with her bush walking club. I guess it is similar to your routine of rising early and working in the quiet of the morning before your family wakes up. There is something about working and getting into the zone when no ones around. Routines are great to help establish a productive time that we can count on. Thank you so much for sharing.